We are excited to announce the release of Gridiron Dynasty 3.1 on May 13th. The new version of our college football simulation game is a major overhaul of the User Interface and is full of significant improvements and additions that we've outlined below. All coaching pages have been overhauled to make coaching your team easier than ever while providing varying levels of customization. The Office home page has been revamped with better organization and a clearer focus on what should be important to you, the GD coach, each day of the season. Setting a practice plan can now be done with just a few clicks as we’ve added defaults, positional plans and a much cleaner user interface. As you move up divisions, you can have more control (if you want it). 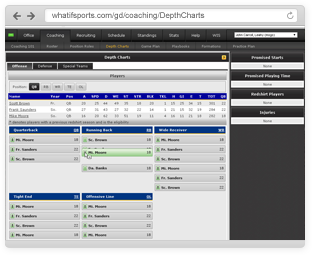 Depth Charts are now a breeze with drag-and-drop interface and position role values for easier decision making. Reset your depth charts to the optimal order with a click. Creating or editing game plans is now interactive with a much better approach to learning as you go. If you’re still into the deepest details, you can still do it as you reach D-II. 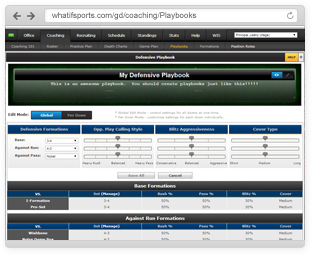 Playbooks are now quick to access and even easier to manage. Use the Playbook Wizard to guide you through the steps, watching how the underlying details change with each decision. Adjust all four downs at once or dig in one by one. Move up division levels and gain access to more advanced settings. Managing formations is now a breeze with cleaner organization and better tools. The first-time user is the big focus on this update. D-III is the level to learn the game with all users playing at the same “Beginner” mode. Coaching controls are still deep, but easier to use. With the improved interface, coaches can see how the underlying settings change with each move they make. When a coach reaches D-II, he can graduate to “Intermediate” or “Advanced” mode where more options are unveiled. Or he may find out he can still compete using the “Beginner” mode interface. Player effectiveness will be directly linked to his current fatigue. As a player fatigues, his attributes slowly decrease. Recovery rate and fatigue rate now flow more realistically throughout a game. Play-by-play has been greatly enhanced and includes better descriptions of the coverage corner backs, battles in the trenches and various other plays. Explanations have been extended to offer a deeper look at what is happening in a game.